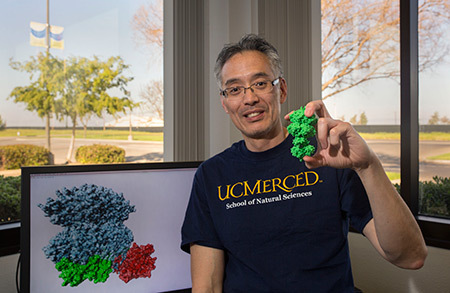 In finding a way to see assemblies of the proteins that direct cyanobacterial circadian rhythms, or biological clocks, UC Merced biochemistry Professor Andy LiWang and his colleagues have done what no one else has been able to, despite more than 15 years of trying. A new paper released in the prestigious journal Science today explains how the labs of LiWang and his colleagues — Professor Carrie Partch in the Department of Chemistry and Biochemistry at UC Santa Cruz and Professor Susan Golden in the Division of Biological Sciences at UC San Diego — captured the proteins in large complexes and made spectroscopic “snapshots” of their different formations using X-ray crystallography and nuclear magnetic resonance (NMR) spectroscopy. Circadian clocks are an ancient evolutionary adaptation that synchronizes genetic, epigenetic and metabolic activities with the Earth’s rotation. Humans instinctively wake when it’s morning and sleep when it’s evening — dictated by our circadian clocks. How that inner clock works is still being discovered. The researchers use cyanobacteria, which are are among Earth’s oldest living creatures. Through photosynthesis and oxygen production, these bacteria are likely the reason all other aerobic organisms exist. Their circadian clock orchestrates gene expression for the majority of the genome to regulate daytime and nighttime metabolic processes that enhance fitness and acutely affect their survival. Cyanobacteria make a perfect subject for structural studies because their circadian clocks can be isolated and studied in test tubes outside their living cells. The research is funded by the National Institutes of Health, and LiWang also receives funding from the U.S. Air Force Office of Scientific Research to build on the circadian clock research he has conducted for several years, in hopes of being able to better explain human circadian rhythms. The researchers set out to capture the structures of the bacteria’s protein clockwork — the equivalent of looking at a watch with all its parts assembled. “The biggest mystery was what the clock was doing at night,” LiWang said. LiWang, Partch and Golden and their labs have been working to understand how three proteins that drive the bacteria’s circadian clock — KaiA, KaiB and KaiC — arrange themselves at different times of the day and how they transition to night. Though they are at three different UC campuses, the researchers each brought their expertise to the collaboration. LiWang, who’s part of UC Merced’s School of Natural Sciences, the Chemistry and Chemical Biology and Quantitative and Systems Biology graduate groups, the Health Sciences Research Institute and the Center for Cellular and Biomolecular Machines, mutated KaiB so it could form stable clock protein assemblies. Partch, an expert in both cyanobacterial and mammalian clocks, carried out the crystallography. Golden, a pioneer of cyanobacterial biology, performed genetic and cellular experiments in live cyanobacteria. A tricky part of being able to visualize the structures is that the protein assemblies needed to be stable enough to form crystals so the researchers could shoot X-rays through them to produce crisp diffraction patterns. KaiB, though, flips between two different shapes, and is only active when it’s in an unstable shape — a situation that until now made crystallization impossible. They were amazed that they obtained crystals within a day of combining the proteins. They also solved an NMR structure of a complex between the active form of KaiB and the domain of a protein (CikA) that transmits signals to regulate gene expression in cyanobacteria. The next big step for this team will be to see if they can peer closely at the fully functional, biological Swiss watch as its molecular components move. LiWang, Partch and Golden are members of the Center for Circadian Biology at UC San Diego, which provides a networking hub for these three labs to interact closely and to meet with other circadian biologists in the region. “Each of the labs contributed very different skills and insights that were key to solving these structures and understanding what they mean for the function of the clock,” Golden said. “The structures of these complexes show the elegance of the cyanobacterial circadian clock, in which the timekeeping gears mesh neatly with the time-telling ‘hands’ of the clock.